I am still not in the mood to go hiking, mainly because it was bitter cold outside over the last days. But I was pretty slow with my blog this month, and I really don’t want to get used to the laziness and looked through my photo library to see if I can at least share some older photos. 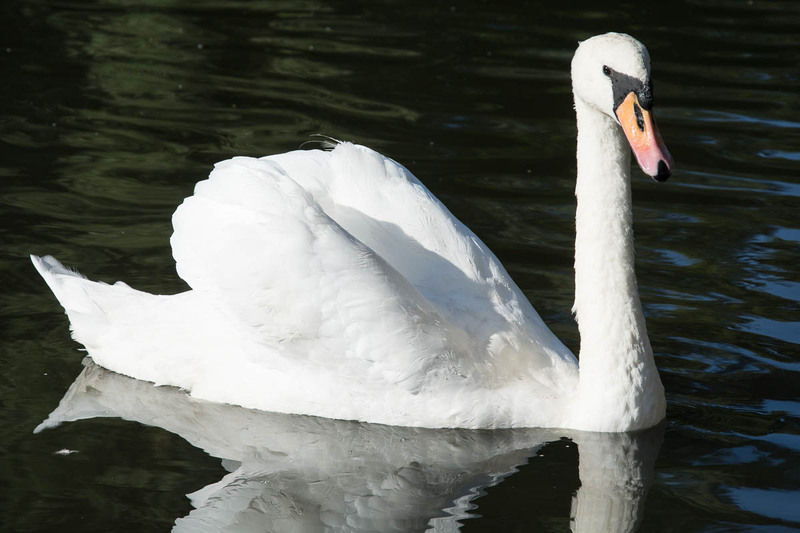 I found a photo of a white swan, and while I do already have similar photos on my blog, I thought this one was worth to upload too. I hope you like the photo. [ Smiles ] Yes, Dennis. You are right; that swan is indeed beautiful! That is a great photo. I like the reflection. I like taking photos of birds. I have been busy and stopped but I want to get out in nature again with my camera. Same here. Recently I did rather upload the photos that I shot during summer and spring, and a few that I shot during autumn. I was not much outside with the camera during winter. It’s still quite cold outside, at the moment I prefer to sit inside and play PC games 😀 I do however can’t await spring to go out with the camera again.